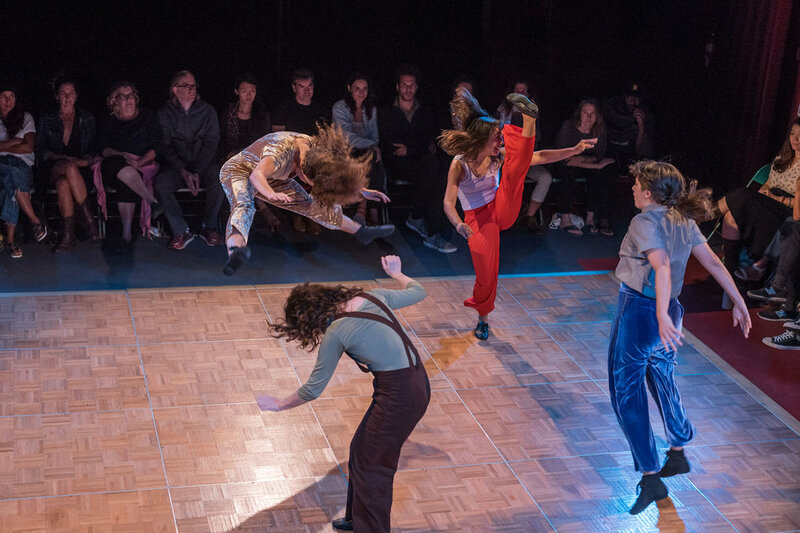 Questioning contemporary dance’s predisposition towards neutrality, authenticity and the de-sexualization of the female body, ANTHEM embraces theatricality, virtuosity and sass. The work weaves together existing and imagined vernacular dance styles to explore labor, play, and feminine-posturing. Four women execute a repetitive yet complex movement vocabulary that evolves as they rotate hypnotically within the confines of a square. Over time, the meditative rigor of their steps dissolves into a tangle of commotion, blurring the distinction between the mundane and the glamorous. ANTHEM premiered October 2017 at the LAX Festival and is commissioned by the Chocolate Factory Theater and Los Angeles Performance Practice. ANTHEM was made possible in part by the Lewis Center for the Arts at Princeton University, a Pennington Dance Group SPACE GRANT @ ARC Pasadena and the Z. Clark Branson Foundation.